Paulo Miyao claimed gold in the adult 69kg final. The Abu Dhabi Grand Slam Jiu-Jitsu World Tour’s fifth and final leg began in London on Saturday at the Copper Box Arena, where some of the world’s best black belts’ entertained British fans with a display of the highest level of jiu-jitsu. In the much-anticipated match between Paulo Miyao and Isaac Doederlein in the adult 69kg finals, Miyao won via 4-2 points decision after a tough fight and Brazil’s Thamara Silva took the gold in the female adult 70kg against Samantha Cook. 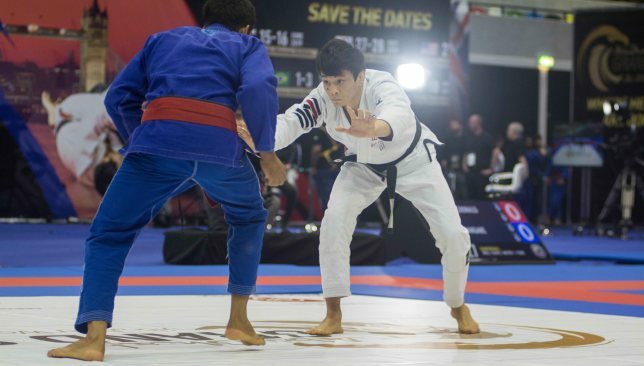 More than 2,000 fans attended day one at Queen Elizabeth Olympic Park, creating an energetic atmosphere in the venue to cheer on the superstar black belts and also the brown and purple belts. With a stacked line-up of some of the best black belts in the sport of jiu-jitsu featuring Mayssa Bastos, Silva, Cook, Gabrieli Pessanha, Hiago George, Joao Miyao, Paulo Miyao, Tiago Bravo, Doederlein, Lucas Barbosa, Adam Wardzinski, Ricardo Evangelista, Igor Silva and many more, the brackets produced some skillful performances. Commenting on his win at the 69kg male adult black belt category, Miyao said: “I am obviously delighted with the gold medal today, this rounds off a perfect season for me at the Abu Dhabi Grand Slam. Miyao, who is one the best jiu-jitsu black belts in the world, has been made the favorite to win the Abu Dhabi King of Mats title. “I have seen that the media has mentioned me as being the favorite, and the fans expect me to win the Abu Dhabi King of Mats title easily, but I don’t see it that way,” he added. Commenting on her win at the 70kg female adult brown/black belt category, Brazil’s Silva, who has also won gold in Tokyo, Los Angeles and Abu Dhabi this season, said “The 70kg category is one of the most skilled and toughest, so it’s great to win here in London. 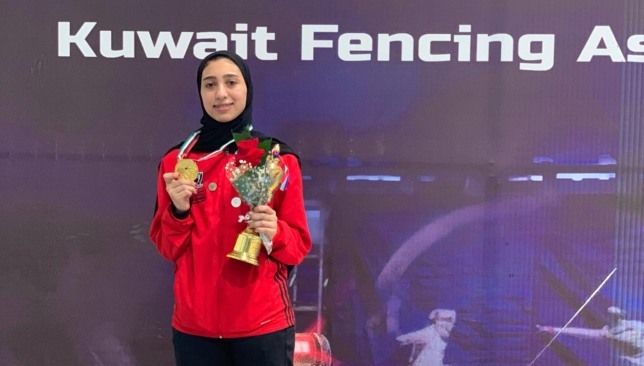 Fencer Noora Al Braiki, part of the Fatima Bint Mubarak Ladies Sports Academy (FBMA) elite programme, recently won three medals at the Cadet and Junior Arabian Tournament in Kuwait. The FBMA congratulated Al Braiki on her recent victories ahead of her upcoming tournament at the FIE World Cup in Austria. She only joined the FBMA elite athlete programme in November: a programme dedicated to the development of girls 16 and over, offering training in a variety of sports after a stringent selection process. Only three months later she has started her journey as a successful Emirati fencer. During the tournament in Kuwait, Al Braiki won gold in three categories as part of the UAE team: junior, youth and team. Speaking about her win and her upcoming event in Austria, Al Braiki said: “Winning these medals is an absolute honour for me. “It is a reflection of my hard work and dedication to the sport, and I would like to thank not only my family for all their support, but my coach and the sterling encouragement from the academy. Al Braiki is now gearing up for the FIE World Cup in Austria, where she will compete in the ladies foil junior individual and team events. Taking place from February 16-17, you can follow Al Braiki’s progress via the FBMA’s Instagram account as she will be doing a social media takeover. You can keep up to date with her progress at ADFBMA. Fatima Al Ameri, from FBMA, said: “As we continue to nurture the talent of female athletes across the capital, it is a delight to see Noora Al Braiki win so strongly in Kuwait this month. “Having Noora as part of the academy is testament to our mission to promote and further develop Emirati talent, and with a view to honour and celebrate Emirati athletes with an ultimate goal of prompting local participation in the Olympic and Paralympic Games, and instituting a culture of sports participation and excellence in Emirati society. Erberth Santos was a popular winner on home soil. 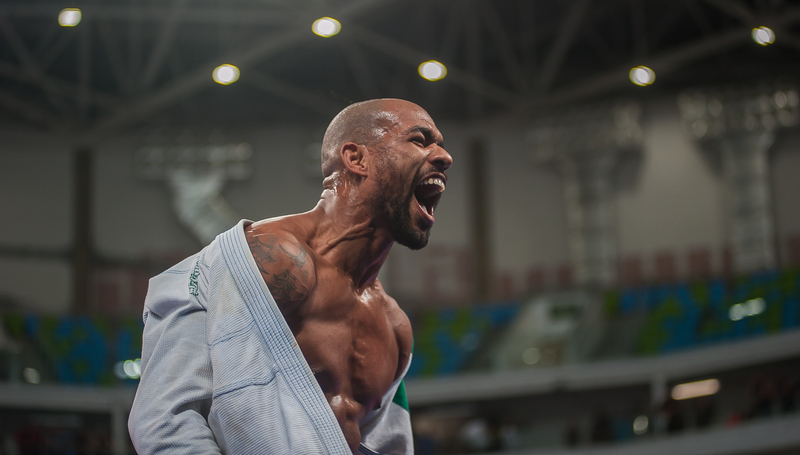 The Abu Dhabi Grand Slam Jiu-Jitsu World Tour came to an end in Rio de Janeiro on Sunday, with home favourite Erberth Santos sending the majority of the 7,000 fans inside the Carioca Arena home happy after claiming one of the major honours. In one of the main fights of the glamour black belt division, 24-year-old Santos defeated Fernando Reis to claim victory in the adult black belt 110kg final. The Legends match between fifth degree black belts, Rafael Carino and Alexandre Barauna, was played out in front of an electric crowd. In a very tactical match, Carino won by a split decision after a 1-1 tie on advantages. Commenting on his win, Carino said: “It was a humbling experience last year and the same this time, thank you UAE Jiu-Jitsu Federation for inviting me back. Rafael Carino defeated Alexandre Barauna. President elect of Brazil, Jair Bolsonaro, attended the third and final day of the championship in Rio. Mr Bolsonaro said: “Brazil has strong relations with the United Arab Emirates, I have a firm desire to deepen these relations during my term in office, especially all the things that we have in common between the two countries. Tournament director Tareq Al Bahri added: “It was an honor to receive the president elect of Brazil, Mr Jair Bolsonaro today. He is a very busy person, but he showed today that he works for the people of the country by coming and greeting his supporters. The fourth leg of the Abu Dhabi Grand Slam Jiu-Jitsu World Tour heads home to Abu Dhabi next in January, 2019, taking place from January 10-12. For registration and more information, visit – https://events.uaejjf.org/en/event/121.